HVAC system significantly impact energy requirements and indoor environmental quality of buildings. HVAC systems must provide thermal comfort as well as acceptable indoor air quality. 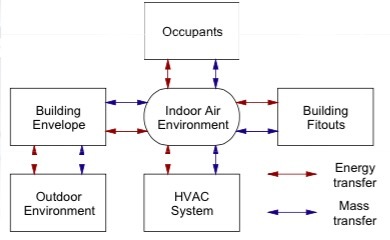 Indoor air environment is influenced by many parameters in a complex web of interactions in a dynamic system. The main physical transfers are: Heat, Mass and Momentum (air flow). There is also continuous interaction between the outside and indoor environment. Ventilating (all year round) is the supply or removal of air in any space to provide high indoor air quality (i.e. to control temperature, replenish oxygen, or remove moisture, odours, smoke, heat, dust, airborne bacteria, and carbon dioxide). Ventilation is for odour control and excessive moisture, introducing outside air, to keep interior building air circulating, and to prevent stagnation of the interior air. Ventilation includes both the exchange of air to the outside as well as circulation of air within the building. 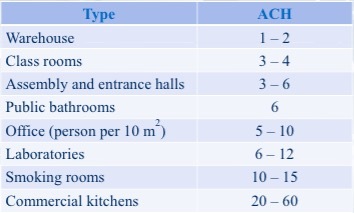 It is one of the most important factors for maintaining acceptable indoor air quality in buildings. 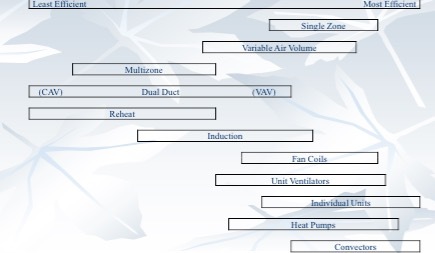 Methods for ventilating a building may be divided into mechanical/forced and/or natural types. It’s purpose is to add or remove heat and/or humidity from occupied spaces; and supply fresh air to meet health requirements. 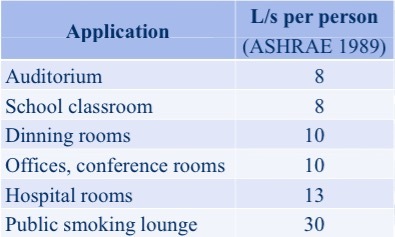 AS 1669 Part 2 defines minimum levels of ventilation in offices: generally 10 L/s per person. Fresh air can be either outdoor air or treated indoor air with minimal contaminant levels. 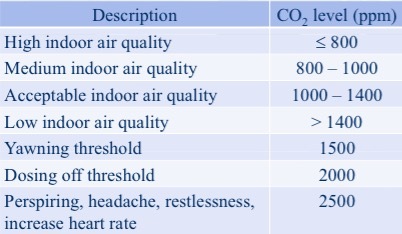 In some countries, outdoor air is quite contaminated and unsuitable for use in buildings. The removal of stale and polluted air from the inside of the building to the outside and replace it by an equivalence of fresh air. The Air Change Rate is the air change per hour which represents the number of times per hour that an enclosure’s total volume of air is exchanged with indoor air. Active (fan forced) /Mechanical supply of air. Such as ceiling fan, floor, displacement along walls. Limitations: Variable results due to the reliance on wind speeds which varies with height. Outdoor air pollutants can easily enter the building, smoke and fire spreads. 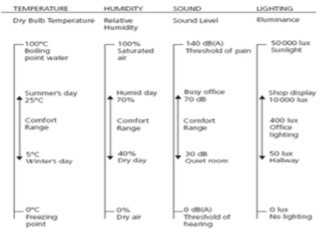 Heating and humidification (in winter) and the air conditioning and dehumidification (in summer) provide the the closely controlled indoor environment necessary for the comfort, working efficiency and well being a building’s occupants. HVAC Systems include the heating and cooling equipment (e.g. Boiler, Chiller, Heat pump), Air handling unit (AHU) and the Distribution and supply of heat and coolness (steam pipe, chill water pipe, air duct). 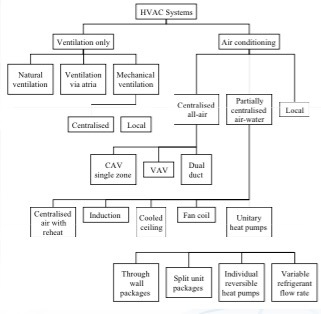 Variable Refrigerant Volume (VRV) System: Unlike CAV systems, which supply a constant airflow at a variable temperature, VAV systems vary the airflow at a constant temperature. It differs from VAV systems, which work by varying the air flow to the conditioned space based on variation in room loads. The advantages of VAV systems over constant-volume systems include more precise temperature control, reduced compressor wear, lower energy consumption by system fans, less fan noise, and additional passive dehumidification. Displacement System: Supply air at a low velocity (~0.2m/s) at low level into an occupied space.Cooler air supply forms a layer at low level which slowly rises to replace the air present in the room. Exhaust is removed at high level. It conditions only the occupied space rather than mixing the whole occupied volume. Low velocity means reduced fan power. Smaller chiller size required which reduces energy consumption and plant space required. Chilled Beams or Ceilings: There are three types of chilled beam systems: chilled ceilings, passive chilled beams, and active chilled beams. Chilled water flows through tubes laid in the ceiling or factory assembled beams to carry off the room-cooling load. Cooling transferred to occupant through radiation exchange which then cools the body. Air is still supplied to meet fresh air requirements and remove to latent load. Reduction in air volumes results in low noise levels, reduction in plant space requirements and lower energy consumption. This entry was posted in Efficient Buildings and tagged Air conditioning, CAV, Chilled beams, Displacement System, energy efficiency, heat pumps, Heating and Cooling Systems, HVAC, indoor air quality, Indoor environment quality, Mechanical Ventilation, natural ventilation, VAV, VRV. Bookmark the permalink.